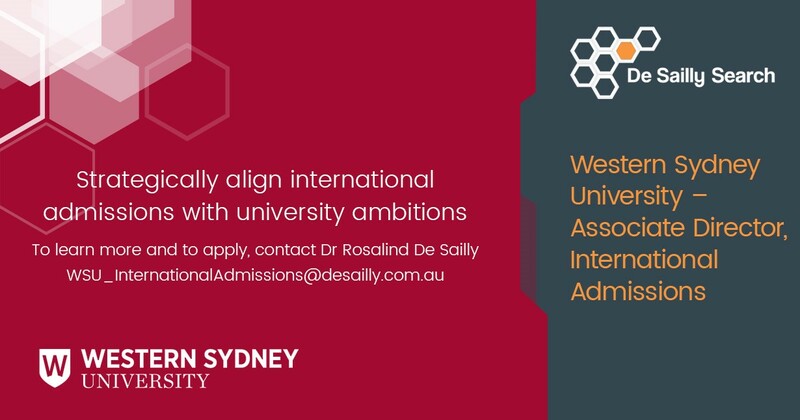 Western Sydney University is a modern, forward-thinking, research-led university, located at the heart of Australia’s fastest growing and economically significant Western Sydney region. Boasting 10 campuses—many in CBD locations—and more than 170,000 alumni, 44,000 students, and 3,000 staff, WSU is future oriented and expanding its global reach and reputation. The Associate Director, International Admissions is a strategic senior position that leads and manages the high-performing International Admissions Unit. The right candidate will provide vision and thought leadership as well as bringing detailed knowledge and experience of international admissions policies, processes and systems required to meet international enrolment targets and manage the University’s risk and compliance with Australian legal and immigration requirements. The successful candidate will have an extensive record of high-level experience in international student admissions, with thorough understanding of the Australian regulatory and student visa environment, overseas education systems and the international market for higher education. The Associate Director will provide high level advice to senior management on international education and admissions, engage effectively with Schools and the University Executive and partner institutions. The role is responsible for maintaining a culture of continuous improvement in work practices, policies, and systems to meet key performance indicators for service delivery and targets. The candidate will have a successful record of developing and implementing strategies, initiating and managing change, and motivating teams. The successful candidate should also have experience with international admissions systems such as StudyLink Connect. The position is full-time, continuing and is based at Parramatta South. Full applications addressing the selection criteria and nominating referees must be submitted to the email address above, and will be considered until 21 January 2019.